Tower Media Group can handle you vinyl window signs and lettering for business name, limited time offer or directional signage. 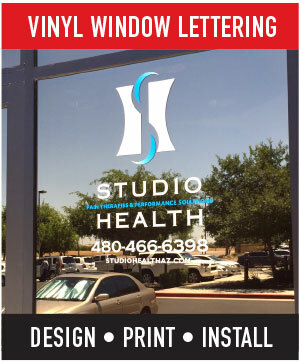 Tower Media Group is an excellent source for window graphics and lettering located in Mesa Arizona. We are not a cookie-cutter, order online only resource. We operate a brick and mortar facility and you can pick up the phone and cal us anytime. Whether you simply need the name of your company added to the door of your suite, or you need full blown graphic treatment on your windows, Tower Media Group can help you out! READY TO APPLY WINDOW GRAPHICS - Many of our customers have some experience applying adhesive graphics to different surfaces and they would rather purchase read-to-apply graphics and do their own installation. ON SITE INSTALLATIONS - Our team at Tower Media includes a couple of great vinyl graphics installers. The are meticulous and take their time to prepare the surface and get the job done right the first time. 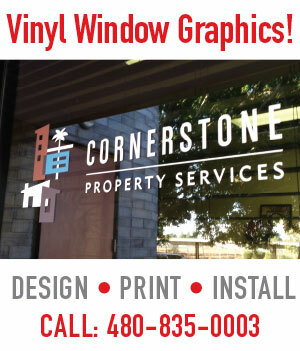 Give us a call when you need window signs or graphic advertising.